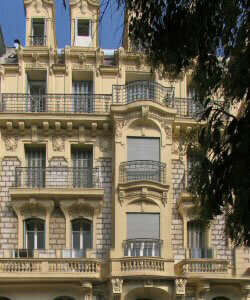 We offer two apartments in the centre of Nice. One is on the world-famous Promenade des Anglais with a sea view. The other is in the exclusive Carré d’Or district which is close to all the amenities and also has a large patio to relax after a busy day. It’s a hard choice to make. Both apartments sleep 4 people and are available all the year round. They are extremely comfortable and well located. Winter offer - from December to March. Summer might be over but some say that Nice is almost as nice in winter. Why not get away from the cold in northern Europe and enjoy the mild and sunny days on the Cote d'Azur? We offer a special low rate of Eur 445 per week. Offer available during Nice Carnival from February 13 to 28, 2016. Click Here For More Information on Winter Breaks in Nice! 2 week bookings: 10% discount on the second week. 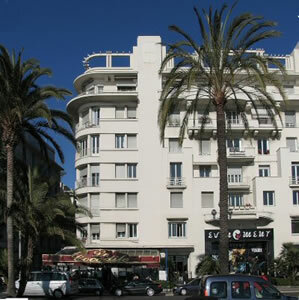 Superb studio apartment on the Promenade des Anglais with sea view, sleeps 4, close to all amenities. Located in the exclusive Carré d’Or district which is close to all the amenities and also has a large patio on which to relax.